The most dire warnings from analysts worry that Brazil may turn into the next Turkey if the left-wing Workers' Party (PT) takes power again... and the Real is tumbling back to cycle lows following the latest poll showing PT dominating with over 37% of the vote. As Bloomberg details, all this pessimism reflects what’s really an intense distaste for the Workers’ Party, known locally as the PT, among investors and business executives. They see the government of former President Dilma Rousseff as largely responsible for bringing about the worst recession in a century before she was impeached, and her predecessor Luiz Inacio Lula da Silva as a crook. While the PT has put Lula forth as its candidate, it’s unlikely he will be allowed to run in October because of a corruption conviction. His probable replacement, former Sao Paulo Mayor Fernando Haddad, gets no more love from traders. One specific concern is that a PT government might seek to unwind the efforts President Michel Temer made to shore up the budget after the country’s credit rating was cut to junk, including a push to overhaul the social security system. Brown Brothers Harriman & Co. says the real could tumble more than 20 percent to 5 per dollar. Bank of America Merrill Lynch sees an even bigger drop to 5.5 under its worst-case scenario for the next government. 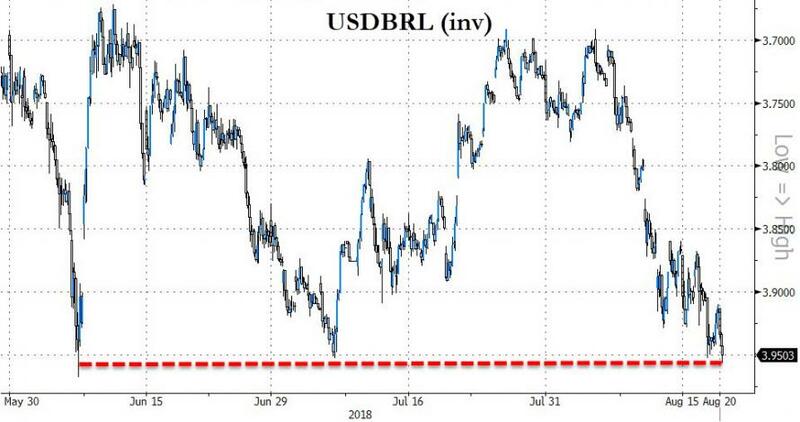 The Ibovespa stock index may lose more than a third of its value, according to the local hedge fund Rio Bravo Investimentos. An unfavorable outcome in the presidential election as well as negative sentiment toward emerging markets globally could send the real to 5 per dollar, according to Win Thin, a strategist at Brown Brothers Harriman in New York.